Rand Paul has a problem much like Mitt Romney did, even though the details are different. Mitt Romney took many liberal positions when a politician in Massachusetts, and then had to flip flop on them to claim to be have been severely conservative to win the Republican nomination in 2012. 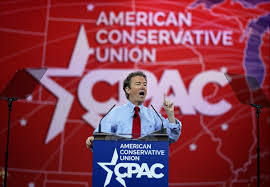 Rand Paul has developed his base as sort of being a libertarian, and now is trying to fit more into the Republican mold to campaign for the 2016 presidential nomination. …Paul is a candidate who has turned fuzzy, having trimmed his positions and rhetoric so much that it’s unclear what kind of Republican he will present himself as when he takes the stage…. There are at least two areas where Paul has moved more in line with the conservative Republican base, somewhat to the consternation of the purists in the libertarian movement: adopting a more muscular posture on defense and foreign policy, and courting the religious right. Where he once pledged to sharply cut the Pentagon’s budget, for instance, Paul late last month proposed a $190 billion increase over the next two years — albeit one that would be paid for by cutting foreign aid and other government programs. His tour following the announcement of his candidacy will include an event at Patriots Point in South Carolina’s Charleston Harbor, with the World War II-era aircraft carrier USS Yorktown as a backdrop. But under Paul’s new plan, the Pentagon will see its budget authority swell by $76.5 billion to $696,776,000,000 in fiscal year 2016. The boost would be offset by a two-year combined $212 billion cut to funding for aid to foreign governments, climate change research and crippling reductions in to the budgets of the Environmental Protection Agency, and the departments of Housing and Urban Development, Commerce and Education. In one sense, you could argue that the libertarian wing of the Republican Party barely exists at all. According to a large Pew Research survey in 2014 of 10,000 respondents, 11 percent of Americans and 12 percent of self-identified Republicans considered themselves libertarian. They met a basic threshold for knowing what the term meant. But there wasn’t much “libertarian” about these voters; over all, their views were startlingly similar to those of the public as a whole. The likeliest explanation is that “libertarianism” has become a catchall phrase for iconoclasts of all political stripes. “Libertarian” seems to have become an adjective for the liberal millennials who are more skeptical of regulations and assistance for the poor than their Democratic contemporaries. The same holds for the deeply conservative college students who may want to, for example, signal socially acceptable views about homosexuality. These “libertarians” have little resemblance to the true believers who might scare everyone else out of the room with their views on a flat tax, the Civil Rights Act and a return to the gold standard. If we take a different tack and use issue positions, rather than self-identification, to identify libertarian voters, we still find only a small number of Republicans who consistently agree with Mr. Paul’s libertarian views. Only 8 percent of self-identified Republican-leaners in the Pew data take the libertarian position on four issues that he emphasizes: disapproval of the National Security Agency’s surveillance program; support for a more restrained American role in the world; skepticism of the efficacy of military intervention; and a relaxation on drug sentencing. Paul also has been trying to find common cause with evangelical Christian voters, who have been skeptical of and even hostile toward the energized libertarian element of the GOP. “The First Amendment says keep government out of religion. It doesn’t say keep religion out of government,” he told a group of pastors at a private breakfast on Capitol Hill on March 26. That is a far better response than what we have been accustomed to from Hillary Clinton, who has repeatedly undermined liberal proponents of abortion rights with calls for abortion to be safe, legal, and rare, stigmatizing women who do seek abortions. Still, while many liberals are unhappy with the prospect that the Democrats will nominate someone as conservative as Hillary Clinton, her views (and the likely views of any Supreme Court justices she would appoint) are far preferable to Paul’s views on social issues, while Paul’s views on national security issues are rapidly moving to be as far right as the views of both Clinton and the other Republican candidates. On the other hand, I do welcome seeing Paul challenge Clinton on other civil liberties issues, such as NSA surveillance–assuming he doesn’t also flip flop on this. Posted in Civil Liberties, Foreign Policy & National Security, Hillary Clinton, Libertarianism, Mitt Romney, Rand Paul, Separation of Church and State, Social Issues. Tags: Abortion, Civil Liberties, Debbie Wasserman Schultz, Hillary Clinton, Mitt Romney, NSA, Rand Paul. RSS feed for comments on this post.. TrackBack URL.